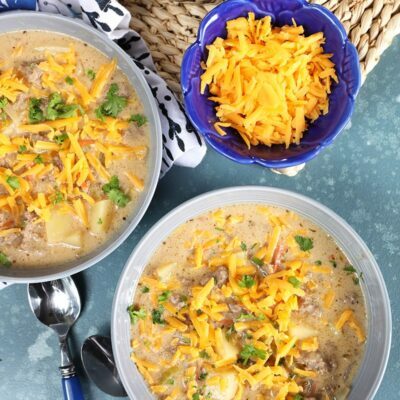 My favorite thing about this recipe has to be the simplicity. The ingredient list is short and you have hardly any work when it comes to prep. Right up my alley. When I first tried this out I was tempted to stir the butter and batter together. Trust me on this and do not give in to those urges. 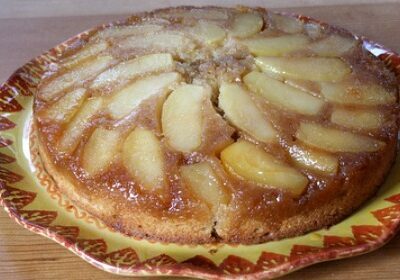 Follow the directions and you will be left with a crispy yet soft crust and sweet peach filling that will disappear in seconds. Once you pull it out of the oven you will can either let it cool and enjoy it chilled or serve it right away for a warm dish. We really enjoy adding a scoop of vanilla ice cream right to the top. The flavors blend together amazingly and leave you feeling satisfied. 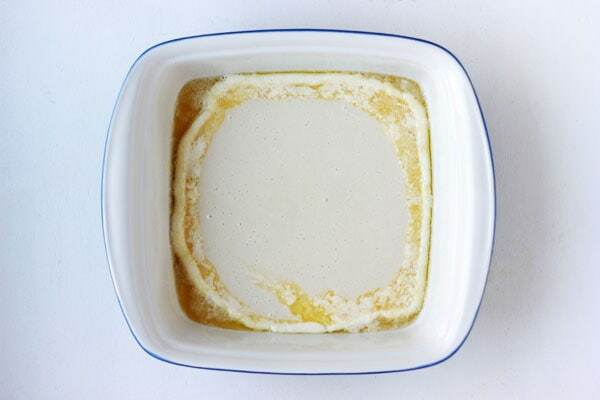 Place the butter into a 9 inch square pan and bake for 2 to 3 minutes or until the butter is completely melted. Remove from the oven and set aside. 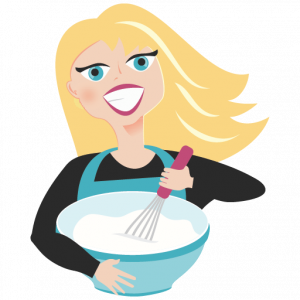 In a medium bowl, whisk together the flour, white sugar, and milk. Pour the mixture directly over the melted butter but do not stir! In a small saucepan combine the peaches, brown sugar, lemon juice, cornstarch, cinnamon, and nutmeg. Stir until combined. Bring to just a boil over medium heat stirring constantly. Pour the peach mixture over the batter in the pan -making sure to evenly distribute the peaches. Bake 40 to 45 minutes or until golden brown. Serve warm with your favorite ice cream. As a substitute for self-rising flour, place 3/4 teaspoon baking powder and 1/4 teaspoon salt in a 1/2 cup measuring cup. Add all-purpose flour to measure 1/2 cup. Decrease the amount of brown sugar according to taste. For riper, sweeter peaches you may not need a full 1/2 cup. This recipe looks wonderful! What are your thoughts on whether I could prepare the peach filling and freeze it to use later in the winter? Thank you! I am counting the SECONDS until the fresh peaches show up at our farmer’s market, and I think I need to make this the second I get my mitts on them. 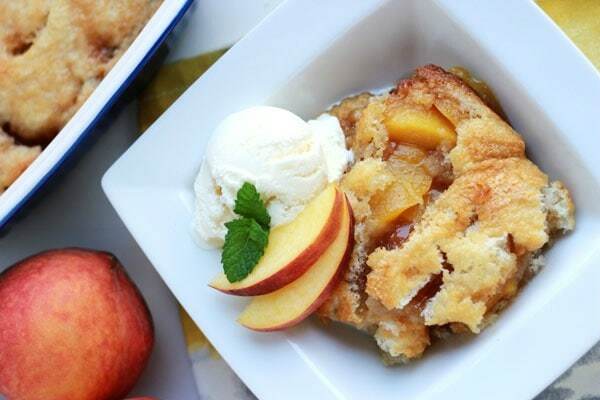 Summer = cobbler! 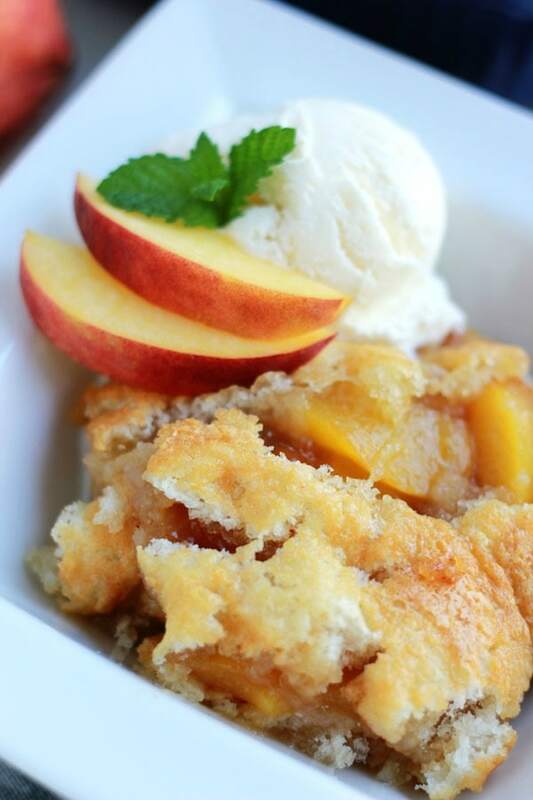 I’ve been making a similar cobbler for at least 35 years, but I’ve never prepared the peaches like that. I’ll have to try that as soon as I get peaches. I’ve actually NEVER had peach cobbler. I KNOW, worst food blogger award goes to ME. But, that just means I need to get my face on this recipe ASAP! Pinned! 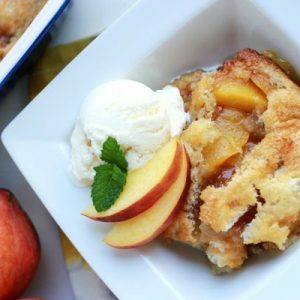 I LIVE for peaches during the summertime, and peach cobbler is my number one reason why! This looks just like the kind I grew up on. 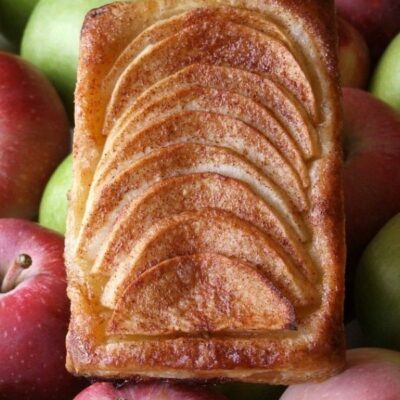 I love the addition of brown sugar and nutmeg though — can’t wait to make this! What timing, Lori and Jessica! I just picked a huge bowl of peaches off my neighbor’s tree that has invaded our back yard, and was thinking of using them in a cobbler. 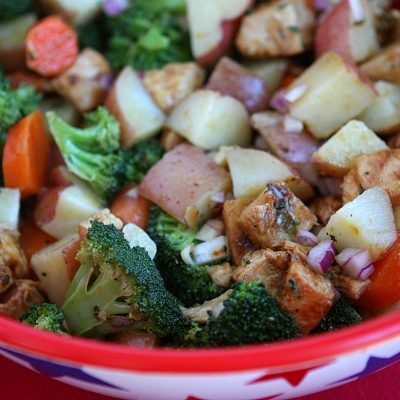 Will make this tonight!